Comprehensive information about Thunchaththu Ramanujan Ezhuthachan including biographical information, facts, literary works, and more. 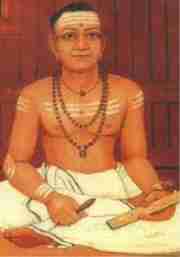 Thunchaththu Ramanujan Ezhuthachan was an Indian poet from around the 16th century. He is known as "The Father Of The Malayalam language" — the principal language of the Indian state of Kerala. He was born in Trikkantiyur, in the town of Tirur, in Vettathunadu. Thunchaththu is his family name, Ramanujan his given name, and Ezhuthachan (schoolmaster) is an honorific title or the last name indicating his caste. His name is transliterated in several ways, including Thunchath Ezhuthachan, Thunchaththu Ezhuthachan, Thunchaththu Ezhuthachchan and Thunjath Ezhuthachan . This educational Thunchaththu Ramanujan Ezhuthachan resource has information about the author's life, works, quotations, articles and essays, and more. Articles about Thunchaththu Ramanujan Ezhuthachan or articles that mention Thunchaththu Ramanujan Ezhuthachan. Here are a few random quotes by Thunchaththu Ramanujan Ezhuthachan.